Take depending on the need for protein from 1 to 4 times a day. Dissolve the portion of 35 g in water or milk. 2-3- portions a day between meals. 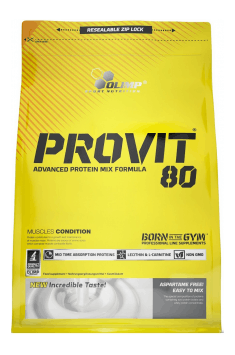 Supplement perfectly complements the daily requirement for proteins. Dosage depends on the type of physical activity to be performed and the chosen training goal. People practicing strength sports and bodybuilding should take from 1.6 to 2 grams of protein per every kilogram of the body weight, the amount may be higher during caloric deficit and weight loss. In the case of building muscle mass, it is recommended to distribute the portion during the day to provide 20-40 g of protein every 3-4 hours. People practicing endurance sports should in turn take about 1.4-1.8 g of protein for every kilogram of the body weight.